Can You Tell Me Who Made This Travel Trailer? Where can I find out where this camper was made and info for restoration? It had a decal on the rear that has faded, "ROYAL HIGHLANDER". More information 1971 Royal Highlander S/N H 17-1788. On the front window shield/awning, there is a image of a Scotchman with bagpipes. Any information will be appreciated!!! ANSWER: Greetings Dennis thanks for submitting your question on our Ask An RV Question Page. My best guess is that this Travel Trailer may have been built by a company called Scotsman. Unfortunately I have no further information on this trailer. I am going to open this question up to our visitors to see if they can provide any further information on your travel trailer. 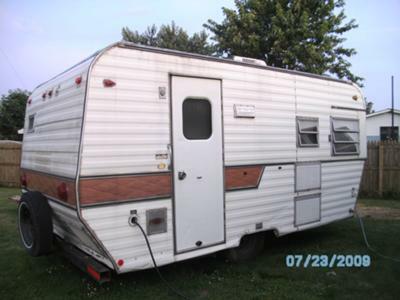 If you know anything about this travel trailer, you can add the information to this page by clicking on the "Click Here To Post Comments" link located near the bottom of this page. Good Sam RV Parks: Top Rated Parks Across the Country. Listings on Over 2,100 RV Parks! Don't Forget To Visit The Everything About RVing Stores. If It Has To Do With RVing And The Outdoors The EARV Stores Have What You Are Looking For! Comments for Can You Tell Me Who Made This Travel Trailer? Seems like there are a number of us who are restoring Royal Highlanders, mine is a 1972, and I can not find info or pictures nor schematics. Maybe we should form a Royal Highlander Association, and attempt to talk the old manufacturer into providing their files on these little beauties. I too have purchased a 70 something royal highlander, dual axles and the trunk in back. I am in the resotation process and would like to know what I need to buy for a fresh water pump to purchase as well as how the water lines run. If you have any schematics,diagrams etc that may help please contact me at becca_830@yahoo.com. Thanks in advance for any help!! my dad had a royal highlander trailer in maine in the early 70's. looked alot like the pic but the rear had sort of a trunk that came out by the bumper. also had double axles cause i remember dad complaining about paying extra tolls. Alot of memories pulling that thing around new england and pa. wish I could help some but I am not even sure if I could find a pic.best of luck restoring her.